Acura today released an image of a prototype NSX supercar, announcing that the running prototype will take to the racetrack just prior to the Honda Indy 200 IndyCar Series race at Mid-Ohio Sports Car Course in Lexington, Ohio. The NSX prototype with custom graphics will lap the road course in advance of the race on August 4, 2013. The race will be broadcast live by NBC Sports Network starting at 3 p.m. EDT. 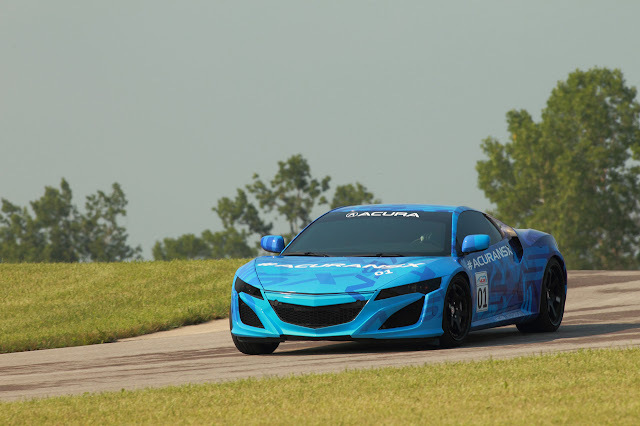 Global development of the NSX, slated for launch in 2015, is being led by engineers at Honda R&D Americas, Inc. in Raymond, Ohio. Additionally, it was announced in May that the next-generation Acura supercar will be produced at the newly established Performance Manufacturing Center in nearby Marysville, Ohio. The prototype model maintains the styling and proportions of the NSX Concept that debuted at the 2012 North American International Auto Show in Detroit, while packaging the production vehicle's mid-mounted V-6 engine mated to Acura's innovative new three-motor Sport Hybrid SH-AWD (Super Handling All Wheel Drive) system.